Dan Haskett, a Harlem native, is a master animator with four decades in the business. With many credits to his name, he is well-known for creating the characters of “Belle” for Beauty and the Beast and “Ariel” for The Little Mermaid. Haskett began his career setting up an animation department for a New York company that did commercials and corporate films. A co-worker told him about a man named Richard Williams, who would later go on to make Who Framed Roger Rabbit? Because of Williams, Haskett got an audience with Frank Thomas, one of Walt Disney’s famed “Nine Old Men” group of directing animators. 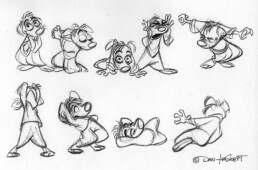 Haskett was offered a job as a junior animator under Thomas on The Fox and the Hound. Freelancing for Disney, Warner Bros. and many others since then, Haskett’s credits include Toy Story, The Prince of Egypt,Sesame Street, Scooby Doo, and has done commercial work for Kellogg’s and Nestle. He won an Emmy for his work on The Simpsons. 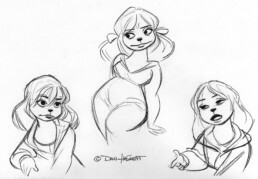 Haskett helped pioneer a resurgence of classic Disney qualities and “organic” animation.